Featuring Rhydian Lewis on Vocals and The Swinging Residuals 8 Piece Big Band. Australia has had a love fair with Mr Bublé since 2003, when his debut Album Reached no1 in the Aria Charts. Since then he’s had two Australian sell out tours, released another 5 albums sold over 100 million records and got married. Michael Bublé has jazzed up Jazz and brought the timeless classics back, to be introduced to new generations. With 8 piece Big Band, “The swinging Residuals” & front man Rhydian Lewis, this is a show that brings all of the hits to the stage in a powerful and intimate way. All the songs played are from the original Bublé arrangements, to keep the authenticity. Nicholas Laganin is Musical director, and has created a talented band from the Brisbane and Golf Coast area. The Musicians are mostly in their 20’s and all play with a contagious joy that really kicks off any party. Foot tapping crowds cannot help but be drawn to the music of one of the worlds biggest selling artists. The show features songs that Dean Martin, Sinatra and Bobby Darin would have sung in their lifetime. 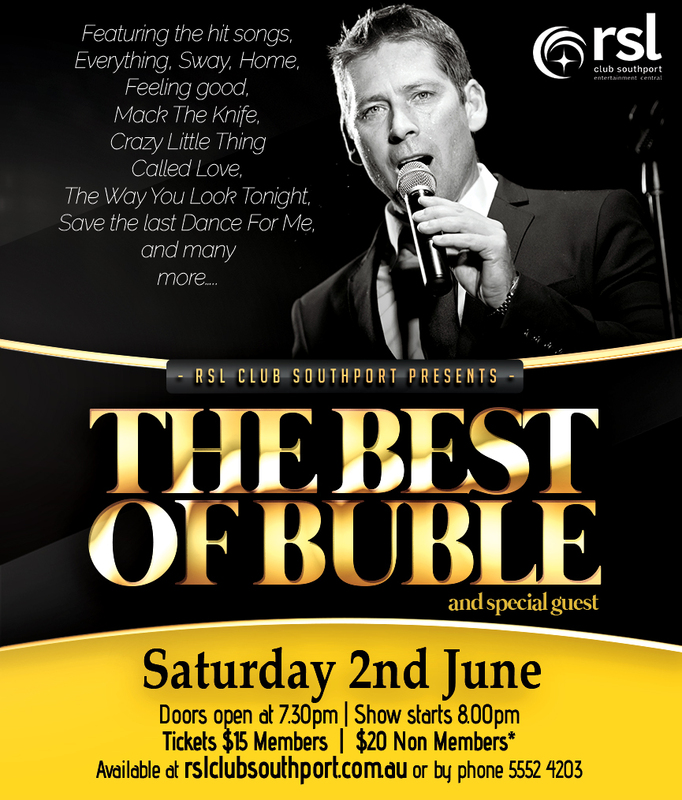 Featuring all time Classics such as “Beyond The Sea”, “Come Fly With Me”, & “The Way You Look Tonight”, this show is a journey down memory lane, partnered with the original songs “Home”, “Everything” & “Lost” by Michael Bublé. With a whirl wind of platinum hits, the up tempo songs will have you tapping and wriggling your behind in your seats. Hits include “Sway”, “Save The Last Dance For Me”, “It Had better Be Tonight”, “Moondance”, “Heartache Tonight”, “Baby You’ve Got What It Takes” and many more. Rhydian’s narrated stage talk is brief but interesting, and gives details about how Bublés relationship forged some of the most moving loves songs of his career to date. If you’re a fan or just love the music of Michael Bublé, then it will be Rhydian’s pleasure to help recreate those favourites.